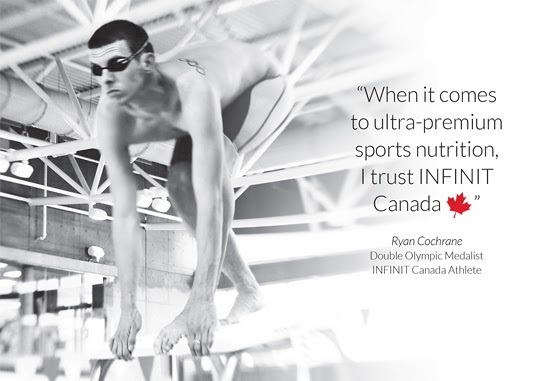 We are incredibly proud to announce that Ryan Cochrane has joined Team INFINIT. Ryan is a two time Olympic medalist having earned a silver medal in 2012 (1500m freestyle, London) and a bronze in 2008 (1500m freestyle, Beijing ). Born and raised in Victoria, BC, Ryan will be working directly with the crew at Infinit Canada to elevate the Infinit brand with swim teams and elite athletes across Canada. Ryan has trusted ultra-premium Infinit as his fuel of choice since 2007: "I use Infinit because I can trust it. Their products are the best on the market, and make a major difference in my training each and every day." Ryan uses both sport-specific and fully custom formulas from Infinit Canada. Ryan represents the exact type and quality of athlete we look for. He's Canada's top swimmer, of course, but he's also atuned to the importance of a thoughtful approach to nutrition. Indeed, there is a sincerity and trust in our partnership — Ryan has been fueling on Infinit products since 2007 and we think the results speak for themselves. Triathlon Ontario, the governing body of the sport of triathlon in Ontario, announced today a one-year sponsorship agreement with INFINIT Nutrition Canada. This agreement represents the first sponsor of Triathlon Ontario and its members in the history of the organization. INFINIT Nutrition Canada fuels hundreds of Canadian Olympians with a partnership list that includes Swimming Canada, Cycling Canada, Rowing Canada, Canadian Sport Institute Pacific and Canadian Sport Institute Ontario, not to mention Boston’s Dougie Hamilton along with other current NHLers. Now they want to fuel Triathlon Ontario. INFINIT's custom approach generates a custom formulation that is made to exactly match each individual's nutritional requirements - all the carbs required from three different sources to maximize uptake, all the sodium/electrolytes needed to maintain balance, protein to get you through Iron distances if required and key amino acids that will help prevent muscle breakdown and aid recovery. Best of all, the single source for all your nutritional needs will be formulated to be isotonic to your bodily fluids - this ensures immediate gastric emptying and then rapid absorption across the small intestine. Fuelling on INFINIT during training, racing and while recovering ensures you take full advantage of all your hard work, allowing you repair, grow and ultimately perform at your potential. Triathlon Ontario members will receive a 20% discount on all purchases of INFINIT Nutrition products when they enter the product discount code TO2014 during their online purchases, plus members will get a free nutritional consultation to assist in the creation of their own custom formulation to best suit their personal racing and training needs. Exclusively for the launch of this new partnership, INFINIT has created a special triathlon package of its Go Pack product line that includes: 2 Ride Go Packs, 1 Run Go Pack, 1 Repair Go Pack, 1 Jet Fuel Go Pack and 1 Raw Go Pack. The regular retail price (including shipping) for this bundled pack is $74.95 but with the 20% discount, T.O. members get it for $59.95, (a $120 value). Infinit Canada's President, Darcy Haggith, was recently featured in the Dave Hall's Windsor Star column. "After using its customized sports nutrition products for 18 months and seeing his Ironman Triathlon time fall below 11 hours for the first time, Darcy Haggith decided to bring Infinit Nutrition’s product to a wider Canadian audience. Haggith, who has 22 years experience in the pharmaceutical industry, bought the rights to use U.S.-based Nutrition’s name for $10,000 in 2006 and now operates a independent stand-alone version of Infinit, currently in the process of moving into larger quarters on Walker Road from a small operation in Amherstburg..."
Infinit Nutrition Canada is pleased to announce the appointment of Darcy Haggith to the full-time role of Chief Executive Officer of Infinit Canada, effective immediately. As a founding member of Infinit Nutrition Canada, Haggith had maintained a limited role as he continued to work as a senior level director for a pharmaceutical company in Windsor while working to build the current leadership team at Infinit Canada and helping to grow the brand's ultra-premium reputation among Canada's elite athlete and triathlon communities. Haggith accumulated over 22 years of experience in the pharmaceutical industry and led the manufacture of pastes, powders, tablets, sterile liquids and soft gelatin capsules, working within strict regulatory environments with full compliance with Health Canada and FDA guidelines. “I started my career in an industry that demands and expects the absolute highest standards of production. My increased role at Infinit Canada will be an easy shift in that regard, as we are certainly committed to the production of the highest quality sports drink available,” said Haggith. In his new capacity, Haggith will help drive the company's overall business development, sales expansion for the new retailer-friendly, sport-specific GO! Pack line of products, and the company's custom program with trusted partners at the Canadian Sport Institute, professional hockey player Dougie Hamilton of the Boston Bruins, and the 2013 Infinit Canada Elite Women's Cycling team. Haggith expects to begin sales outreach initiatives in the immediate future. Interested retailers are invited to contact the corporate headquarters and production facility in Amherstburg.